I recently purchased Apple's Magic Trackpad and I’d like to use it with not only my iMac but also my MacBook Pro. The problem is that I can’t figure out how to tell it to switch from one Mac to the other. What’s the secret? Open the Bluetooth system preference and enable the Show Bluetooth Status In the Menu Bar option. When you do this and click on the Bluetooth menu in the Menu Bar you’ll see that all the Bluetooth devices you’ve configured for your Mac appear in this list. To unpair the Trackpad from the Mac it’s currently paired with, just select its name in the Bluetooth menu and choose Disconnect from the submenu. Once you’ve unpaired the keyboard, move to the Mac you want to pair it with, click on the Bluetooth menu, choose the Trackpad, and select Connect. If the Trackpad is stubborn about pairing, turn it off by pressing and holding the Power button on the side. Then switch it on by pressing the Power button. If the Mac still won’t pair with it, turn it off, and press and hold the Power button until the Trackpad's LED blinks. This switches the Trackpad into pairing mode and your Mac should recognize it and pair with it. No? 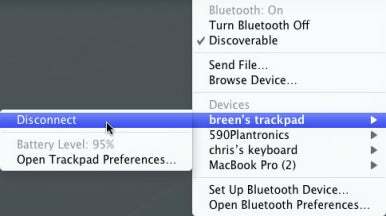 Open the Bluetooth system preference, locate the trackpad in the list of devices, and click the Minus (–) button at the bottom of the device list to remove it. Then click the Plus (+) button to launch Bluetooth Setup Assistant. The Trackpad should appear in the list of available Bluetooth devices. Click the Continue button and the Mac and Trackpad should pair.